Fire crew receiving a briefing on August 5. 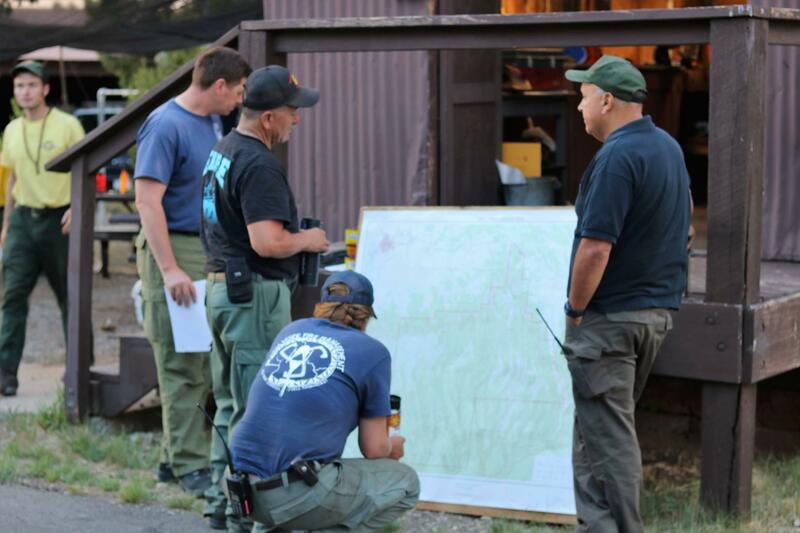 At 7 a.m., the Durango Type 3 Incident Command Team transitioned operations back to Mesa Verde Fire Management. As the fire continues to smolder, the park will keep it staffed with one engine and crew. Post-fire assessment by cultural resource advisors will determine the effects, if any, the fire and firefighting operations had on the park’s cultural sites. A release from Mesa Verde’s public information officer said the fire revealed at least two undocumented cultural sites, as observed by firefighters and archeologists in the field. Moccasin Mesa Fire topped off at 185 acres Sunday, a limit attributed to the mesa’s burn scars stifling its growth. It was started a day before by a lightning strike. The B Cut parking lot near park point, which was used for fire personnel, is expected to reopen this afternoon.